CGA represents members from all facets of the industrial and medical gases and equipment industry. The industry is defined as international, national, and regional industrial and medical gas companies, distributors, transporters, and manufacturers of related equipment. Our membership includes over 100 companies ranging from multinational corporations to family owned businesses, and every member company gets an equal voice in our process. 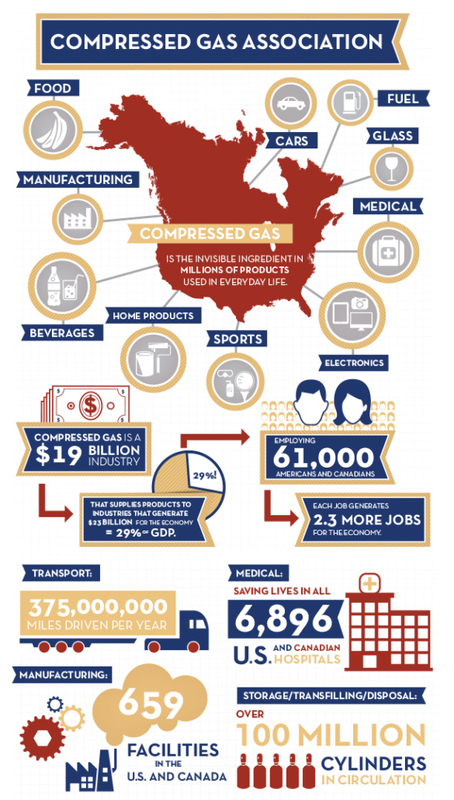 Compressed gases are the invisible ingredients in millions of products used in everyday life. Together, our members supply products to industries that account for nearly 30% of the U.S. gross domestic product. In fact, every job our industry creates generates 2.3 additional jobs elsewhere in the economy.